La Terenuri is an area in Mănăștur, a large socialist neighbourhood in Cluj-Napoca. Its name is evocative with respect to its eclecticism as sports area, play ground, agricultural land and barren land. At first, it was used entirely for agricultural purposes; afterwards, the socialist regime set it up for leisure activities: sports area, play ground. However, the memory of the area remained true to its initial use, a food landscape in an urban setting. The Association Colectiv A was attracted to this place and started its interventions in 2012, as part of the European project “Landscape Choreography: from wasted to shared land“. Their approach is inter-disciplinary, involving several connected areas: architecture, art, landscaping and anthropological analysis. 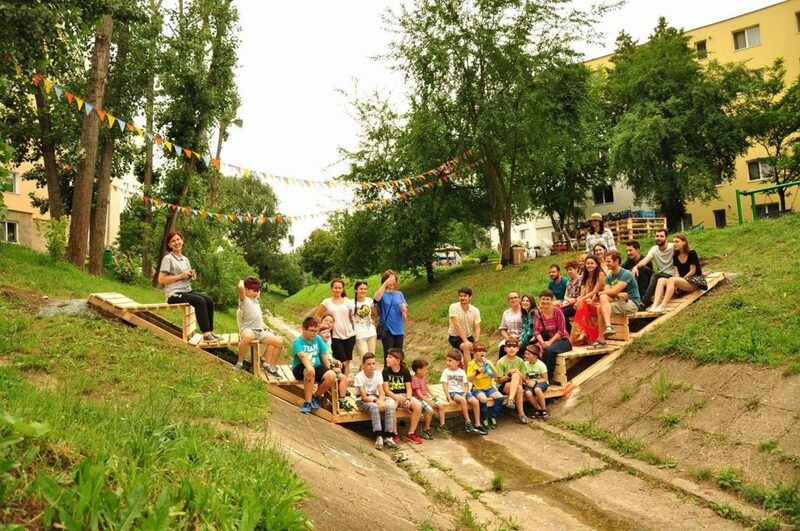 Nowadays, La Terenuri is an area which has become an urban laboratory, where urban gardening meets multi-disciplinary events in the form of social and artistic interventions and creating a collective conscience regarding the possibility to use the public area in a free and creative way. The urban garden which they have set up is looked after during the entire year and it grows products obtained from traditional seeds.